1 Integrated structural design Integrated motor with built-in controller motor with external controller easy installation with bulit-in controller,save installation space and reduce wring fault for e-bike, the e-bike appears simple.easy maintainance. 2 Reduction gear brushless and gearless gear When e-bike overloads or climbs,the gear is easy heating with deformation.Then gear ware will result in the teeth fracture and motor can not work. Gear structure will bring noise,low efficiency and short range. 3 Multi-voltage open voltage <24V-48V> only one voltage: 24v or 36v or 48v the voltage of the battery is proportional to the revolution of the motor. 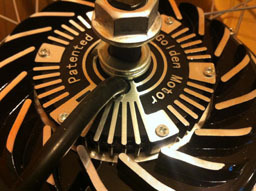 As the the magic pie series motor is geearless, it has no wear and tear.Besides,when designing,the multi-voltage are taken into consideration and the motor can work effectively under different voltage.So the user can improve the speed and power rate by replacing the battery to adapt to the different riding terrain and load. Smart pie motor: 200W - 400W 250W If you want to upgrade the power and speed of the e-bike, just replace the battery.It is unnecessary for you to replace the motor and controller. 5 Cooling and Radiating Built-in cooling fan no cooling fan According to scientific testing and user experience, good thermal has a great impact on the the reliability and efficiency of the motor and controller. 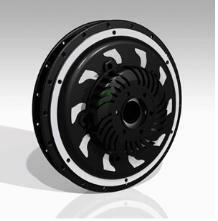 Built - in cooling fan can quickly diserse the 60% heat generated by the motor, greatly improving the performance and reliability of the motor and controller.The advantage appears apparently when climbing the long slop. 6 Heavy current handling capability 30A 15A As the controller uses high - quality, high - capacity power components, it can handle the momently heavy-current output, enhancing the accelerated performance and climbing ability of electric vehicles and greatly reducing the burned possibilty of motor and controller under the impact of heavy current. 7 Programmable Intelligent Controller Programmable Non-programmable Professional users or dealers can programm the controller via USB to PC so that you can adjust and optimize the electronic control parameters. Then the e-bike will be safer and more comfortable when riding.Riders can enjoy the longer range and the life span. 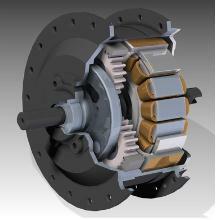 8 Regenerative braking Available unavailable Magic pie series motor has the unique and reliable regenerative braking function. When breaking,the motor becomes the generator.it can break quickly and smoothly and let the inertial kinetic energy to become electricity charging the battery.With this unique function,rider will enjoy the safe and comfortabel journey and longer range.When downhill,it also re-charge the battery and decelerate. 9 Overheat and Overload Protection Available unavailable When the e-bike overloads and climbs the long slope under high temperature,motor and controller is easy to over-heating. Controller of magic pie motor has the bulilt -in sensor which can detect the internal temperature.If it beyonds the allowable temperature,the controller will timely stop the power supply to the motor and shut down the system avoiding the damage.User will re-start the e-bike after the ebike cools naturally.The controller will detect the temperature again.If the temperature is lower than the the set protection value,the motor will work again.This function will reduce product failure rates and protect the customer's property. 10 Plug-and-play integration harness Waterproof , anti- wrong , plug-and-play military standard connector harness . Convenience, aesthetics , and reliable. User-replaceable , and greatly reduce the after-sales service . 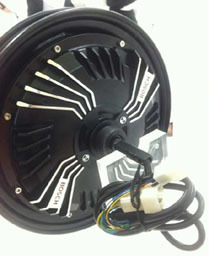 Other brand motors use cheaper loose connetors, wires exit from hollow shaft end which can cut wires/cables easily during transportation, or when the ebikes fall down to ground at the side.